Robby Mathis is from Macon, GA and deeply passionate about all things flight, fly fishing, and accounting. Robby's day gig is tax consutling - working with entrepreneurs, non-profit leaders, and small to mid-size business owners. Robby graduated from Mercer University with a Master of Accountancy. After graduating, Robby worked for PriceWaterhouseCoopers and eventually made his way back to Macon to work with non-profits and business owners. By way of Dancing Stars of Central Georgia, Robby has found that as a tax accountant in tax season he loves the outlet of dancing. My grandfather, John E. Donahue, taught me to do the best I can. That's truly what I'm doing in Dancing Stars. 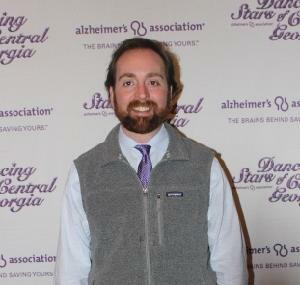 I'm not a trained dancer, but I'm dancing to end Alzheimer's. Alzheimer's was never in my plan. Work doesn't stop anymore than life. But, you do what you have to do and you honor your word. Alzheimer's is in no one's plan. We adapt and we can work for a cure. Alzheimer's was an attack. Alzheimer's stole my grandfather slowly and in the sneakiest of ways. This is the least I can do for him, my family, and so many others. We'll end this. We end this by starting where we can - now.